Read what our guests say about their stay with us at South Fleetwood. Just returned from our 3rd visit to South Fleetwood. We just love the cottage. We truly treasure every minute. If you are looking for a quite place to just unwind and relax look no further th e n South fleetwood. The nicest beach in the world is only a minute from your door. Kit and Collin are friendly helpfully and informative. This little oasis they have built is amazing. Testimonial: What can we say about South Fleetwood when we were there early May 2014? It was a wonderful experience. The temperatures that week were low-mid 80s and perfect! It is a minute or two walk to the breathtaking white sandy beach. It's about a 5 minute walk to the shops in town and a 10 minute walk to the IGA. Every few days before it got warm we would walk to the store to get food and beverages. We didn't rent a car but didn't feel we needed to since we stayed close. Our focus was to relax and to simply have fun; mission accomplished. The morning walks on the beach overlooking the ocean is hard to describe; there is so much white sand and not a rock in sight, the water is so clear, the different colors of the water are breathtaking, and the sound of the waves hitting the beach is so relaxing. The SF Cottage was perfect for us. We describe the cottage as rustic, clean, private, and an ideal size. We were a few steps away from the pool. The grill definitely came in handy when we wanted to stay put. The Tiki bar was great for eating at and simply socializing with the South Fleetwood neighbors. Kit and Colin would pop in on occasion to make sure we had everything we needed, give suggestions on island activities, and set up taxi service when needed. Those two are so extremely nice and caring people. They made us feel safe....and we were. South Fleetwood is this small piece of paradise with green grass, palm trees, flowers, and PRIVACY amongst all the expensive cement-looking condos with many people. No question we are so happy we chose SF over any of the neighboring condos/hotels. Again, the privacy at SF is unique compared to the other nearby places. Dining out was a lot of fun. One evening we ate on the beach and then danced into the night. Another evening we sat at Hemingway' drinking wine and eating appetizers while watching the sun set. Our favorite restaurant was Coco Bistro! The place was so comfortable, romantic, and the food came out in a beautiful presentation and tasted divine. No question we will be going there a few times on our next visit to TCI! We are already planning our next trip to SF and we cannot wait to get there! We will see you soon Kit and Colin! I'm American and my girlfriend is Irish, we don't get to see each other but a few times a year so I surprised her with a 7 day trip to Turks and Caicos for July 4th 2011. Upon arrival at this beautiful property, Kit was waiting with a huge smile on her face and a very sweet welcome bottle of champagne on ice ready for us. The villa is very cute, It was a fantastic place to stay - quiet, private, relaxing, beautiful deck to relax on, high vaulted ceilings a nice big bathroom. The bed was comfortable and the kitchen was equipped with everything that we could have needed except food, for that we drove to IGa Supermarket. The prices are major expensive but what do you expect on a tiny island. It was a plus to be able to walk to most beautiful Grace Bay beach! This property is very private, it almost feels like you have it all to yourself. We will never visit and stay at another property. The property was so cute, little smiley faces on the palm trees and lizards running around at your feet, really tall palm tree above your head. I rarely ran into the other guests on the property but when I did we had great chats. Kit and Colin were there for us at every moment and gave us so much great advice on where to eat and places to visit in our car. We rented a car at the airport because we read that to make the most of your time its best to get one. So glad we got a rental car, we were zooming around the island all day and got to see every inch it had to offer. I do recommend taking a day trip to Sappidillo Beach - We found all directions were wrong from the magazines etc ...Take the first dirt road left after the police station and you will find it. My wife and I stayed in the "Cottage" for eight nights in early July. For perspective's sake, we travel quite a bit and usually stay at Marriott resorts, and since we have status, usually get upgraded to better rooms or suites. I've got to say, that South Fleetwood significantly exceeded our expectations and turned out to be one of the most relaxing and "easy" vacations we've been blessed to be able to take. Colin and Kit have put their heart and souls into South Fleetwood and it shows. Everything is comfortable, thought out for a good experience for their guests and just very gracious. Kit was away while we were there so we only had the chance to meet Colin and get to know him a bit and thoroughly enjoyed our interactions with him. What to know if you are considering renting at South Fleetwood? First of all, yes, do it. It's all about expectations. If you are looking for a "corporate" feel - then don't, but if you want comfy, room to roam (on the property as opposed to a room in a hotel) and convenience, then this is the place for you, imho. The beach is a short walk away - 1 or 2 minutes? The beach is nice right out front, we tended to wander to the left (when facing the ocean - so West) and hung out more at the beach in front of "Beaches" resort. There are two public access huts for free to use that we preferred instead of the beach umbrellas that are provided by Colin. But that's just us. We had a car but we like to explore, and since we mostly cooked out at South Fleetwood it was nice to be able to run over to the Grace Gourmet food store (more like a nice US supermarket than a "gourmet" store) whenever we wanted. If this is your first time to Provo (Providenciales) as it was for us, then it might be nice to note that Grace Bay Beach is really all that - soft white sand, clear, beautiful blue water and very undeveloped. The island itself is more scrubish than mountainish so if you are looking for vistas you can do better on other Caribbean islands. Good to decent snorkeling on the island, search the web and you'll find tons of sites and specific details. Great place, great host, great and relaxing time...and I thought, a good value as well. Enjoy! May, 2014 ~ My daughter and I spent 5 days in this wonderful villa. It is so peaceful and a perfect walk to the beach. Kit and Collin are so nice and helpful. I would love to return one day. Thank you so much for having us! North Carolina. Testimonial: What can we say about South Fleetwood when we were there early May 2014. It was a wonderful experience. The temperatures that week were low-mid 80s and perfect! It is a minute or two walk to the breathtaking white sandy beach. It's about a 5 minute walk to the shops in town and a 10 minute walk to the IGA. Every few days before it got warm we would walk to the store to get food and beverages. We didn't rent a car but didn't feel we needed to since we stayed close. Our focus was to relax and to simply have fun; mission accomplished. The morning walks on the beach overlooking the ocean is hard to describe; there is so much white sand and not a rock in sight, the water is so clear, the different colors of the water are breathtaking, and the sound of the waves hitting the beach is so relaxing. The SF Cottage was perfect for us. We describe the cottage as rustic, clean, private, and an ideal size. We were a few steps away from the pool. The grill definitely came in handy when we wanted to stay put. The Tiki bar was great for eating at and simply socializing with the South Fleetwood neighbors. Kit and Colin would pop in on occasion to make sure we had everything we needed, give suggestions on island activities, and set up taxi service when needed. Those two are so extremely nice and caring people. They made us feel safe....and we were. South Fleetwood is this small piece of paradise with green grass, palm trees, flowers, and PRIVACY amongst all the expensive cement-looking condos with many people. No question we are so happy we chose SF over any of the neighboring condos/hotels. Again, the privacy at SF is unique compared to the other nearby places. Testimonial: Our first visit to "Provo" and we picked the best accommodation to holiday at. 1 min walk to the beach (where you could walk miles), close to restaurants, groceries, pharmacy, and rentals. The landscaping, pool, hammock, bbq, and rental suites were the home away from home that we look for. Colin & Kit always the most gracious hosts, making sure everything is good, or just stopping to visit. It is truly a jewel in paradise! Testimonial: My wife and I spent our one year anniversary, and her birthday, at Kit Colin's one-of-a-kind cottage. It could not have been any better! 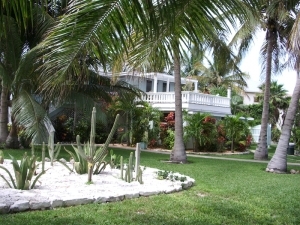 It is a beautiful property,and the beach is literally less than one minute from your door. Turks and Caicos will be the place we compare every other vacation to. It was phenomenal. Staying at South Fleetwood really made this trip that much more enjoyable! July, 2013 - Amazing honeymoon in a lush environment! I'm so glad my new hubby and I decided to pick this place over some generic fancy hotel! We made the right choice! Our cute little villa was the perfect size for the two of us, and was a short walk from the beautiful beach at Grace Bay! Kit and Colin were very friendly and welcoming, treating us more like family than guests. I truly enjoyed chatting with both of them about their lives and this paradise they built entirely themselves! Not only did we have a relaxing and wonderful stay, but we got to take in some culture as well. What a refreshing way to start our lives! 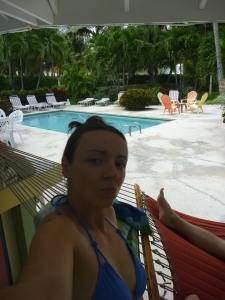 We were just a short walk from entertainment and food, and when we wanted to do something more lowkey, we chilled in the hammock by the pool. I spent a good amount of time wandering around the grounds looking at the fruit trees and many different flowers that we do not have at home. Kit was kind enough to allow me to talk her ear off about all of her plants and trees, hehe. The landscaping reminded me of something you would see in those paradise retreats in the movies! We chilled, wandered around, walked many miles up and down the beach, ate good food (Don't miss out on Somewhere Bar) and had wonderful mixed drinks everywhere we went! I definitely recommend this place to those who want more of a relaxing and private getaway instead of the same ol' hotel stay you can do anywhere else. The whole stay was a lovely experience I will never forget! 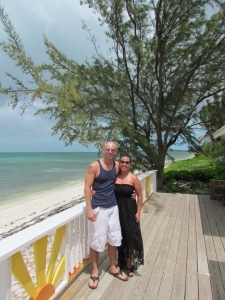 Testimonial: I can't describe how special this trip was for me and my new hubby! The grounds, the villa, the helpful and friendly conversations with Kit and Colin, and the atmosphere made this place feel like paradise! All the comforts of home were neatly tucked away in this private and lush magazine-worthy setting. From the beautiful landscaping, to the hand-planted palm trees gently swaying overhead, this place will remain special in my memory.<br /> <br /> We walked, explored, ate yummy food, had great drinks (Somewhere Bar! ), chatted with Kit and Colin, and many other friendly locals over the 7 day (too short!) duration of our stay. And to Kit, I thank you for letting me go on and on about your fruit trees and plants! We had wonderful conversations, and I'm so happy to have met you! To Colin, I truly enjoyed your sense of humor and happy outlook on life. It was a joy to speak with you as well! And to Shadow kitty, it was amusing seeing you climb the palm trees and chase little grass pieces!<br /> <br /> What I really enjoyed about our stay (right next to all the awesome snorkeling) had to have been the taste of culture we were able to experience that we would not have gotten just staying in some impersonal ol' luxury hotel. 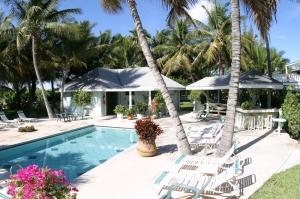 If you want to immerse yourself in the ambiance, have two of the most gracious hosts imaginable, and really get a feel for island life, then Fleetwood Villas will be everything you hope for!